This photoset shows the Stokke Scoot side by side with the Baby Jogger City Versa GT. These photos are purely to give an idea of size and proportion. 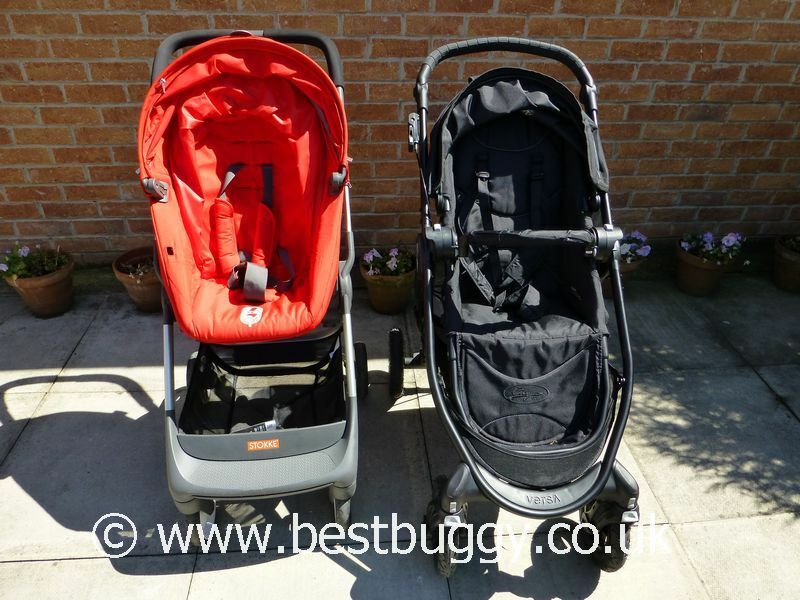 We recommend you read the full reviews of both of these pushchairs to understand how each works and what each can do. Fundamentally both are small neat folding pushchairs and both can be folded with the seat facing in both directions (we have only shown forward facing folding here but the parent facing fold is similar on both). The Versa has 3 recline positions in either direction. The Scoot only has two reclines – lie flat or upright. Please note as well the lack of calf support on the Scoot for a sleeping child. The Versa GT is heavier than the Scoot, but the standard Versa is only 0.9kgs heavier than the Scoot, so almost the same weight. The Versa fold is longer but flatter than the Scoot.